3D bathymetric maps premium – is the highest class of our products consist of several layers of material which reflects faithfully further isolates, a layer of “soil” engraved laser topographic map area surrounding the area of water, and a layer of “water” that protects our work plate of transparent PVC laser engraved names of water reservoirs, bays, islands etc. Layer “ground” can be engraved in wood or laminate, whose surface is metallized and can be gold or silver. The whole twisted the screws with decorative nuts, which gives the product due rigidity and adds a characteristic, a marine look. In addition, the layer of wood can be made by any engraving. wishes of the customer. Dedication, wishes, symbol or logo. 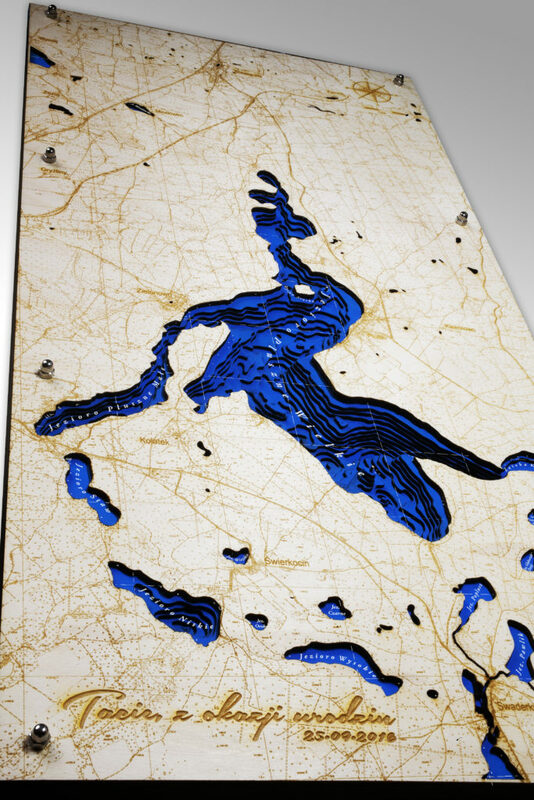 Normally maps are made in the size 59x29cm, but it is possible to create virtually any size, by combining the components. In this version, in addition to the already available projects, we can create virtually any area of water, both lake and sea area (the bay, estuary, a fragment of the sea / ocean and surrounding islands).